If your read the last post about TJ's Gyro Slices, you'll know that I'm a pretty huge fan of gyros. In New York, most street vendors sell them with "white sauce" which is a vinegar-y type sauce that a lot of people incorrectly call "tzatziki". I've read dozens of articles of NYers trying to crack the secret of what's in the "white sauce" every vendor has huge bottles of, but no one seems to know for sure (other than the guys who make it, and they're not talking). 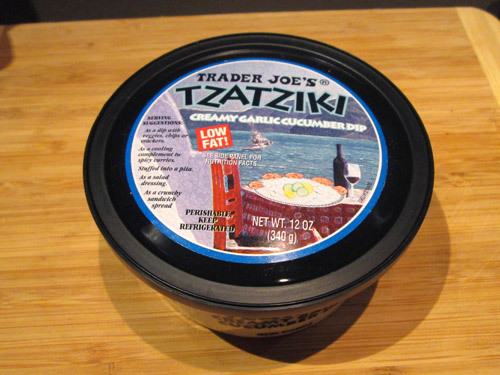 So since I can't duplicate the flavor of a Middle Eastern style gyro like we have on the streets here without a good "white sauce" recipe, I usually use this Tzatziki sauce to try to get a good Greek style gyro when I'm making them at home. 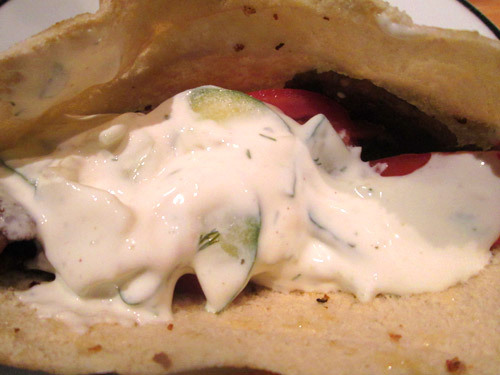 I've tried several types of tzatziki, from homemade, to kinds made at Greek stores in the city. Out of all of them, I think I'd rank this as the best. It's got a nice consistency that's not too thin or too thick, and has a creamy, tangy flavor. You can taste the garlic in it, which goes nice with gyro meat or falafels. But the really great part are the thin slices of cucumber in the sauce. It adds a nice texture to whatever you put it on and tastes fantastic. My only complaint about this sauce is that I can't think of more things to put it on!